I need to do a good long piece on the casino industry, but here’s a little introduction. Get that winning feeling! promises this billboard. All casino billboards say the same thing, either explicitly or implicitly: come here to make money. But this is of course a lie. So why do we let them do it? Though it’s possible you’ll walk out of the Eldorado richer than you walked in, this is unlikely. It’s almost guaranteed that you’ll lose. That’s what a casino is: a place where you lose. The purpose of the casino is to take money from the customers and give it to the house. That’s why it was built. If people don’t lose more than they win, the casino can’t stay in business. The casino exists to take away your money. That’s what it’s for. Isn’t it weird that casinos are allowed to lie so blatantly to the public? In other industries there is at least a token attempt to enforce some sort of truth in advertising. But with casinos (and state lotteries), the core proposition is perfectly false and everyone lets it go. “Come here to win!” No, that’s exactly the opposite of what’s going to happen. Why do we let them get away with this? Once we question the burden of utilitarianism, any attempt to justify it becomes circular. It is true that utilitarianism has no a priori foundation; this is true of all moral systems. I share his resistance to Singer’s suggestion that we avail ourselves of “the point of view of the universe”. It’s close to obvious that the cosmic point of view is tout ça m’est égal — nothing we humans do can make much difference to the sum total of everything existing. But this does not mean that every argument for utilitarianism is circular, only that, as Wittgenstein said, every explanation comes to an end somewhere. The idea that there could be an objective justification for any moral system is a myth. Religious apologists tell us that they have such a system; in their case, the claim is risible, but the idea of such a possibility has caught on. We need to discard it. There is no a priori basis for any ethical system; that’s not how life works. But it doesn’t have to be a priori to be convincing, practical, or beneficial. The justification for utilitarianism is utilitarian. But this is not a circular argument. It starts with the factual observation that we are conscious beings with desires and aversions. One can imagine a universe in which this were not true, so it is not true a priori; still, for us humans on this planet it does happen to be true. Call it contingent if you wish, but in this world it is a fact. Now, the observation of this fact is easiest in the first person, but one sees routinely, indeed one cannot help seeing, that it is true for everyone else as well. I am clearly a conscious being with desires and aversions, and just as clearly I am surrounded by similarly configured beings. This means that everyone in the world divides experiences and situations into preferred and rejected; sought and avoided; enjoyed and detested. Everyone in the world can sincerely say, “From my point of view, temporarily putting aside everyone else, I prefer a world in which A, B and C happen, and not-A, not-B and not-C do not.” This means that it is at least conceivable that there exist (potentially) worlds in which everyone on Earth is happy, is satisfied, has no reason to complain. OK, right away, several hands go up. And, yes, dozens of philosophers have devised hundreds of clever cases, designed to show either that the utilitarian proposal is incoherent, or that it would not have the positive results that are claimed for it. What if, for example, some people are only happy if their neighbors are suffering (sadists) — or when they themselves are suffering (masochists)? Such hypotheticals miss the point. Any system is going to have gray areas, edge cases and outliers. Such problems are not special to utilitarianism. Let’s stick to the basics for a bit. What is the utilitarian principle? What does it tell us to do? It says that when deciding on a course of action, it is best to take account of your actions’ probable effects on all the sentient beings around you, and to choose those actions which will maximize (to whatever extent this is possible) the satisfaction of the preferences of those beings. Why is this the “best” thing to do? Because it maximizes utility. Do we know that maximizing utility is a good idea? Not “objectively”, but not a single person whose utility is getting maximized is likely to object! And if everyone who is affected is in favor, isn’t that pretty much all the approval one could ever need? Utilitarianism’s burden would destroy our freedom to live our own lives, turning us, in effect, into slaves of the general utility of all others. … Utilitarianism requires us to treat ourselves and other individuals as mere instruments in the greater cause of maximising general utility, which is incompatible with having loving relationships where we care for other individuals for their own sake. … A utilitarian must suppress the dispositions to show love or loyalty, or friendship or tenderness, if ever she believes they are detracting from her goal of maximising general utility. It seems to me that this description ignores the symmetry of the utilitarian ideal. I am no more a slave to others’ utility than I am to my own. Besides, how on Earth would maximizing general utility be incompatible with having loving relationships? There’s a heck of a lot of utility in loving relationships. Under what conditions would there be a genuine conflict between my loving someone and my being kind to others? That sounds like a very special situation, which means that the considerations mentioned earlier apply. First, there will always be puzzling cases, and second, all systems will have them, not only utilitarianism. Shakespeare’s Romeo and Juliet describes a world in which to help one person is inevitably to harm another. And the playwright’s explicit moral is: that world is far from optimal. Arguing that utilitarianism is wrong-headed strikes me as perverse — like insisting that “aim for the best result possible” is not known with certainty to be good advice. What the heck is the alternative? Utilitarianism is not so much an argument about how things should be as it is an observation of how things are. People do suffer, and you can sometimes prevent it. And if you can, you should probably want to. That’s what it is to be good. The typical counter-proposal seems to amount to, “You can’t tell me that I have to care about other people.” Well, that’s true. You don’t have to care — but not caring hardly constitutes a coherent framework for moral action. Going through “security” this morning in the Denver airport I was even more disgusted than usual. Look at this phonepic. 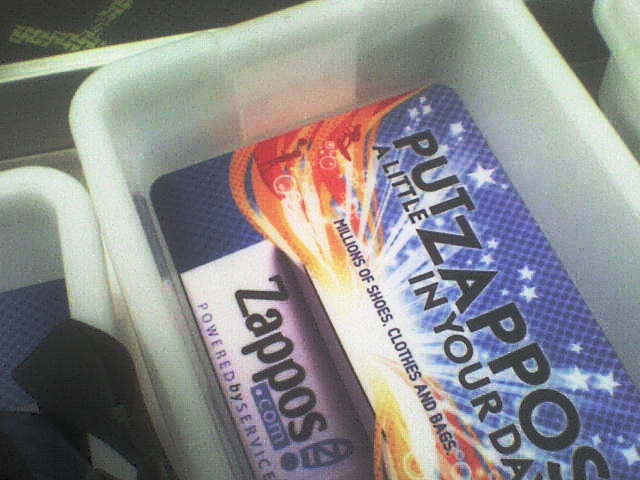 This is one of those ugly plastic bins you have to put your stuff in so it can get “x-rayed.” At the bottom it has a glittering ad for Zappos.com. The TSA are selling ad space on the bottom of those bins. Is there no high-traffic enterprise so sleazy, specious or destructive that it cannot find buyers for its captive eyeballs? Who is the amoral opportunist behind this nauseating innovation? Someone will say: What exactly is wrong with this kind of advertising? Well, setting aside any concerns regarding the ethics of advertising generally, it’s wrong to advertise with the TSA because the TSA is a scam. Zappo’s advertising dollars support the TSA in its mission (otherwise, I think we can fairly assume, the TSA would not solicit such dollars). And this mission has nothing but negative value for the travelers who endure its effects and the taxpayers who fund it. Good organizations do not give money to bad organizations, neither in exchange for valuable goods nor for any other reason. It is unethical to support unethical institutions. Zappo’s should not support the TSA, and we should not support Zappo’s. This is not the place to make a detailed case for the fact that the “Transportation Security Adminstration” provides us no real security and we’d all be better off without it. This has been amply demonstrated elsewhere. Let me just remind you of three points. The TSA has never apprehended a single would-be terrorist. This is partly because the TSA’s procedures are inadequate to catch any reasonably determined terrorist. Most important: the TSA’s very existence is based on a lie. The international terrorist organizations from which it is supposedly trying to protect us do not exist. The primary and sole purpose of the TSA is to make this completely fictitious threat more credible. Every year since 2001, we taxpayers and travelers have been wasting tens of billions of dollars and hundreds of millions of hours on this absurd, insidious charade. I call on Zappo’s to terminate their relationship with the TSA immediately and to issue a public apology. Only if they do this will I stop telling everyone I know not to shop there. There are many other wonderful places to buy shoes online. These include DSW, Endless (an Amazon offshoot), Gotham City Online, Piperlime (part of the Gap/Banana Republic/Old Navy empire), and ShoeMetro. There are only two moral positions: it’s OK to hurt other people, or it’s not. None of us hold either position consistently; on the other hand, it might still be fair to divide people into good and evil—based not, please note, on some notion of how they “really are,” but on their external behavior at a given moment. Evil is when people act as if hurting other people is perfectly fine. The conservative style is to behave as if it’s a good idea to hurt at least some people, at least some of the time, if you reckon you’ve got a good reason. Liberalism when you treat other people as generally precious and generally not to be harmed, except under certain circumstances and only if you are exceptionally confident of your reasons. (Of course no one can ever agree on which circumstances are appropriate, or which reasons sufficient.) And finally we have the good person, who does not hurt other people, period. I repeat. Our scale measures behavior, not ideas or words. A good person is one who does not hurt others, not one who thinks or says that hurting others is wrong. If you can refrain from hurting other people, you can ignore the whole idea of right and wrong. Tell us you’re doing it because Jesus told you to, or because you despise people who complain; tell us that you don’t know why you’re doing it. If you’re being good, it does not matter why. Of course, if you’re hurting people, that too is independent of any ideas you might have of what’s right or wrong. There may be ideas that can reassure you that although you’re doing something bad, it’s not as bad as people might think, because you have good reasons for it; you’d be doing something good if you could, because you’re basically a good person. Well, I’m here to remind you how seriously lame an excuse that is. The people you are hurting do not know or care why you are hurting them. Nor should they. Hurting is hurting and while you are doing it, you are wrong, because hurting is always wrong. In fact, hurting is wrong by definition. That’s what ‘hurting’ means. You can’t do it and be in the right. The upside is, you will be right as soon as you stop—at that very moment (but no sooner!). An interesting aspect of our simplistic scale is that almost everyone tends to rate themselves a notch or two higher than they are. People who exhibit evil behavior tend to say that sometimes you have to harm other people, it can’t be helped—a conservative position. In practice, of course, they do it anytime they want to. Die-hard conservatives will tell you that it’s only OK to hurt other people under exceptional circumstances. However, their behavior implies that most circumstances qualify as exceptional. And many liberals will swear that harming people is never OK; what they seem to mean is almost never, which is a whole different thing, seems to me. Only being good is being good. It doesn’t matter what you think in your mind. It doesn’t matter what you say. It doesn’t matter what books you read or what posters you have on your walls. Bad is never good. You can’t fake this or talk your way around it. It’s too high, you can’t get over it; you gotta come in at the door. Only good is good. From Scary Go Round, 9 April, 2008. One’s beliefs regarding the parameters of ethical behavior depend on one’s beliefs regarding the structure of the world. For example, if one believed that suffering in this world leads to pleasure in the next world, one would be that much happier to endure pain, and that much happier to inflict it. Fortunately, no one believes this.